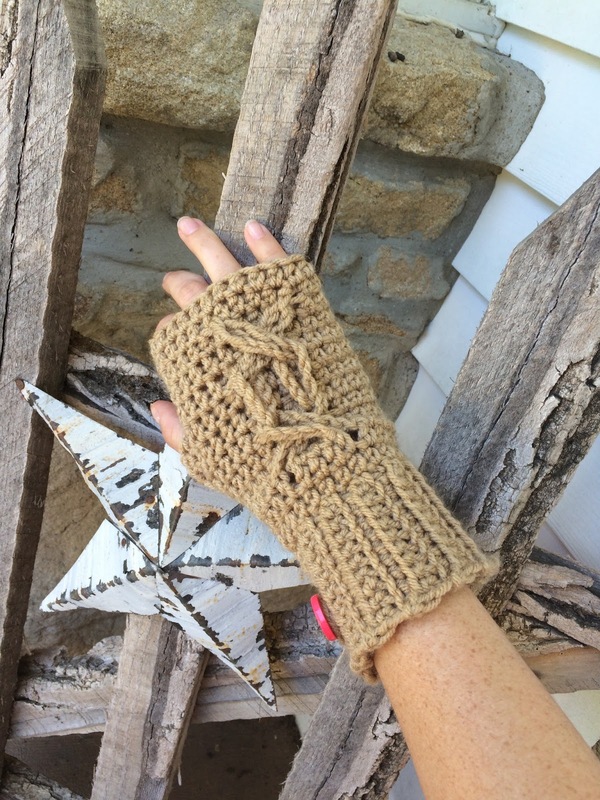 These fingerless gloves with cute "cable knit" design will make a comfy addition to your fall accessories collection. These are my first gloves! 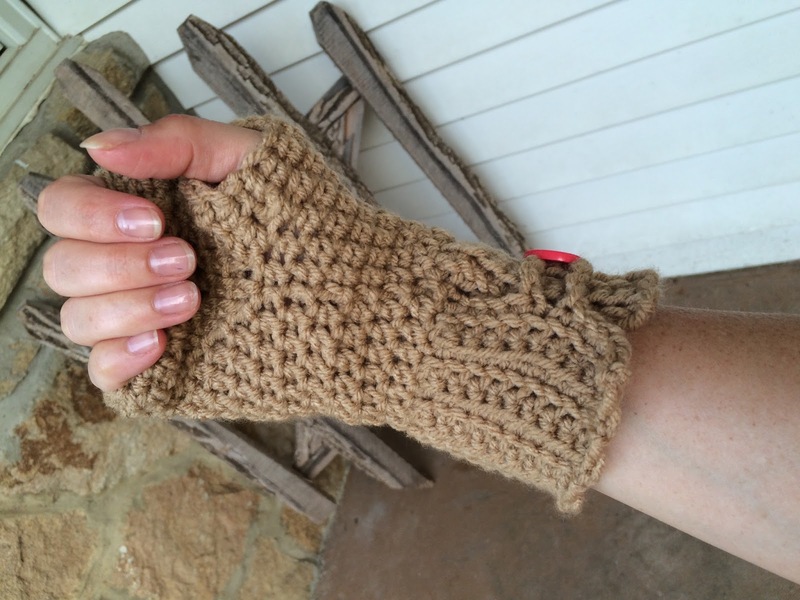 They have been a labor of love and my most challenging design and pattern written to date! But don't fear, the hard work has all been done for you. And draft after draft, version after version, the pattern is finally, *hopefully* flawless. They are a breeze to construct and for gloves, they work up surprisingly quickly. Other mittens and gloves I've made are usually in single crochet, and my goodness- they take forever to make! These are different- I think working in half double makes all the difference. Not only is it a thicker and taller stitch, thus reducing the number of rows needed; it is a much more attractive stitch in my opinion. These were worked using Red Heart With Love in Tan. I just love this yarn it is so soft and thick and very nice looking. It gives your projects a more polished look. It really is one of my go-to yarns. These gloves were created after a special request by a friend of mine for some easy on, comfy and not-too-tight fingerless gloves for fall and into winter. As I began searching around I found lots of basic looking gloves and mittens, and I just was not feeling any of them. I wanted to make her something special and new. It turns out, she has helped me as much as I have helped her- by giving me this idea! 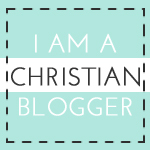 An idea which has blossomed into a gorgeous original design that I'm so excited to share with you! Cable knit designs are some of my favorite, and in crochet, we can't "cable knit" but we can still stitch in "cabled" designs. I can't take credit for coming up with the loop weaving cabling idea. It came from a book filled with different patterns and techniques (and full credit is given on the written pattern). 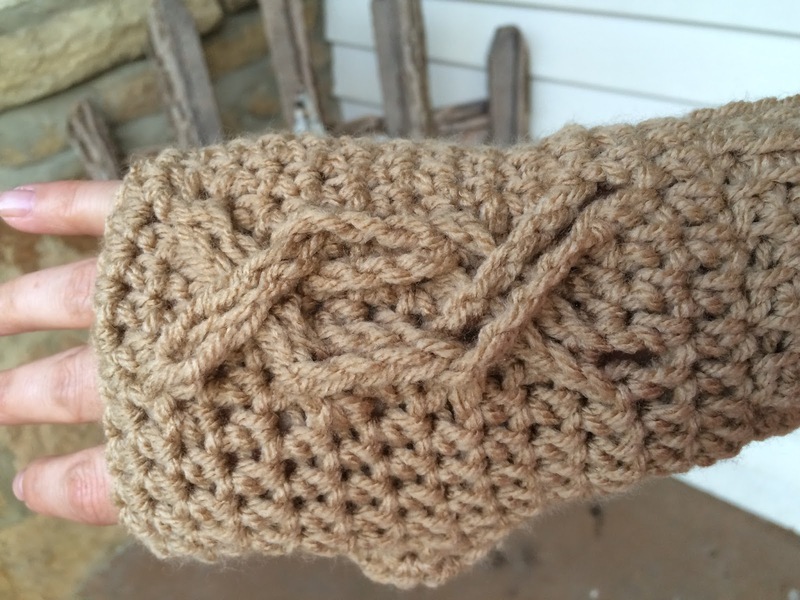 I adapted this technique for use on my gloves and it came out stunningly! 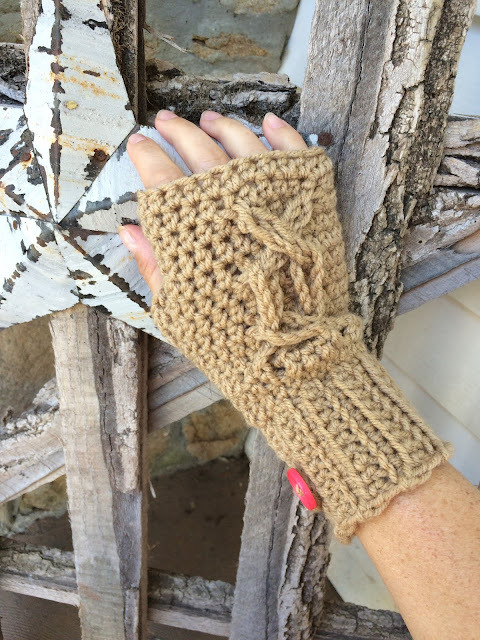 I hope you enjoy making your own gloves just in time for fall, and I know they will look beautiful in any variety of colors and yarns! I would love to see a picture of your gloves, be sure to post and share on my Facebook page. The pattern will also be available on Ravelry so be sure to add it to your queue! Also don't be shy- if you have any questions or comments or corrections for this pattern leave me a comment and we'll work together to make it right! You may sell items made from this pattern, but please be courteous, always credit Haute Kippy with the original design and link to my blog when possible. Notes: Worked in one piece from bottom up. Alternating work in back and front loops creates striped pattern on cuff. Forming and weaving loops on glove creates a “cable knit” looking design. 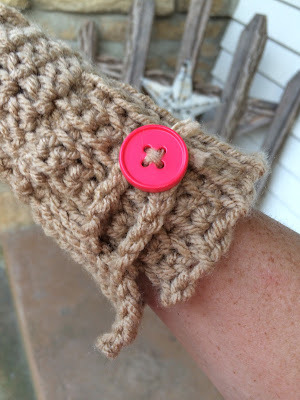 Loop and button on open ended cuff add visual interest to the design. This design should fit an average sized hand apx. 7 ½” across knuckles when crocheted somewhat loosely. Row 1: Ch 21, sc in second ch from hook, sc in each of the next 5 chs, sk the next 10 chs, sc in the last 5 chs. Row 2: Working in flo, sc in each st across, ch 1, turn. Row 3: Working in blo, sc in each st across, ch 1, turn. Pivot work in order to crochet along row edges, keep right side facing, do not break yarn. Rounds 4 and 5: Hdc in each st around, sl st to join, ch 1. Round 7: Hdc in each st around, sl st to join, ch 1. Round 9: Hdc in each of the first 2 sts, hdc in each of the next 4 chs, hdc in each of the next 6 sts, ch 10, hdc in each of the next 4 sts, ch 10, hdc in each of the last 7 sts, sl st to join, ch 1. Rounds 10-12: Hdc in each st around, sl st to join, ch 1. Beginning with bottom loops, cross one over the other to form an “X”, then thread the second row loops through the bottom row loops on their corresponding sides. Next, thread the third row loops through the corresponding loops directly below. Lastly, cross the top loops one over the other to form a second “X”. 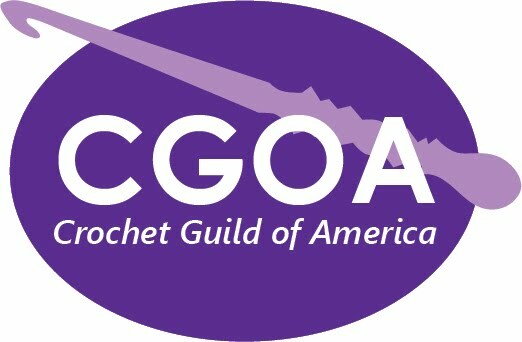 Remember what position the top loops need to be in as you continue crocheting row 13, where the loops will be stitched into their final position. Round 13: Hdc in each of the first 14 sts, hdc through the first loop of the upper “X” of the vertical cable knit design AND simultaneously INTO the next st, hdc in each of the next 4 sts, hdc through the next loop and into the next st as before, hdc into each of the last 3 sts. Round 14: Hdc in each st around, sl st to join, FO. Round 2: Hdc in each st around, sl st to join, FO. Sew a button on the opposite cuff to fasten the cuff opening, use loop made as closure. If desired, sl st along bottom edge of cuff on right side. Row 1: Ch 11, sc in the second ch from hook, and in each ch across, ch 1, turn. Rows 4-22: Repeat rows 2 and 3, ending on a flo repeat. Row 23: Working in blo, sc in each of the first 5 sts, ch 10, sc in each of the last 5 sts. Round 9: Hdc in each of the first 7 sts, ch 10, hdc in each of the next 4 sts, ch 10, hdc in each of the next 5 sts, hdc in each of the next 4 chs, hdc in each of the last 3 sts, sl st to join, ch 1. Weave loops same as right hand glove. Round 13: Hdc in each of the first 4 sts, hdc through the first loop of the upper “X” of the vertical cable knit design AND simultaneously INTO the next st, hdc in each of the next 4 sts, hdc through the next loop and into the next st as before, hdc into each of the last 14 sts. Complete thumb hole and finishing same as right hand glove. Weave in all ends.